I created this dish as part of a “hooray I got the bulk bin resource section done” and to show you a recipe that used both bulk bin and seasonal items. But honestly, I could care less about the lentils and rice. Don’t get be wrong, I love curry and I love lentils but the rhubarb chutney? That’s where the magic happens. I can narrow it down even further. If you scroll down and look at the recipe for the chutney, you’ll notice there is no sugar, no sweetener. Yes, that’s right. It’s a rhubarb recipe without sweetener. But you know what? It’s delicious. It’s amazing. It’s the power of dates. I scoured the internet researching chutney recipes and when I became bored with ugly looking chutneys with raisins in them. I didn’t have raisins, which didn’t really break my heart, but I did have dates. Dates and rhubarb work wonders together. It’s as if dates bring out this hidden sweetness in rhubarb with leaving just even tang and taste to know the rhubarb is there. It’s a beautiful thing. Pair it with curry and a little bit of greek yogurt- you have one heck of a meal. I’m seriously excited about this date/rhubarb revelation and I can’t wait to play around more. For now, however, you should take a look at this chutney (along with the curried lentils.) Also, don’t be frighten by the long list of ingredients- most of these are things you could probably find in your cupboard! Oh, and don’t forget to check out my latest bulk bin resource section! In a medium pot, heat olive oil for rhubarb chutney. Add in onions and ginger, cooking until fragrant, 2-3 minutes. Add in vinegar and give a good stir to loosen up an stuck onions. Add in the remaining ingredients and reduce heat to medium low. Let chutney cook until rhubarb and dates have broken down into a chunky sauce, 15-20 minutes (depending on stove-top heat.) Remove cinnamon, taste and add seasonings if needed. Remove from heat and let sit until ready to serve. To make lentils, follow a similar procedure to that of the chutney. Heat olive oil over medium heat. Add in onions and garlic, letting cook for 2-3 minutes. Next, squeeze in lime juice and add 1 tablespoon of your favorite curry powder. Let cook for one more minute to get the curry powder fragrant. Add in lentils and three cups water, bring to a boil, then reduce to a simmer. Let lentils cook until tender but not mushy. If you find the lentils are still not tender and most the water has been absorbed, add in a bit more water to reach desired consistency. I will taste occasionally along the way to determine doneness and to determine if I need more curry powder (which you should add as you see fit.) Stir in cilantro and let cook for one more minute. 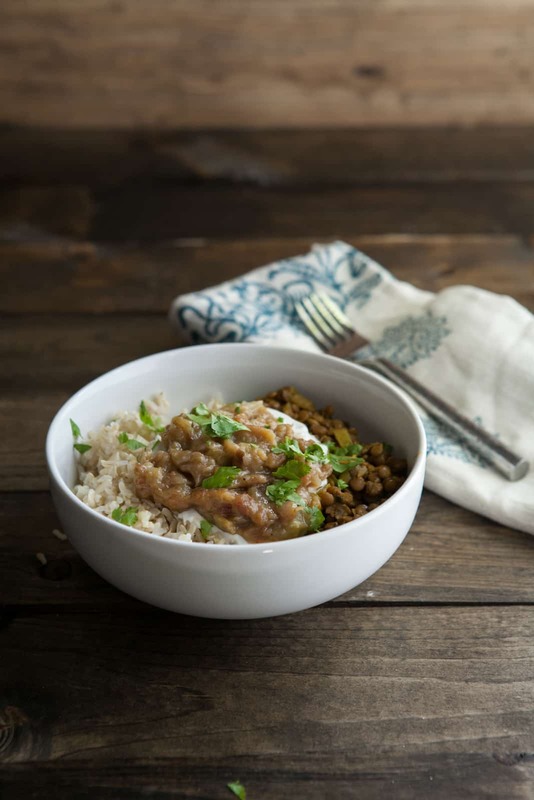 Serve lentils over your favorite cooked grain (I like brown rice for curries) and top with a big scoop of rhubarb chutney, plain greek yogurt, and cilantro. ***A note about curry powder. I’m very picky when it comes to this. While I rarely construct my own, I have an army of different types of curry powders in my cupboard that I purchased from a spice shop. The one I used for this particular meal was a salt-free hot curry powder purchased from the spice shop in Breckenridge, CO. For more information on quality spice shops, see this post. This meal sounds fabulous! I love this idea! DAD gum this is one beeeeautiful dish. Sold. I can’t wait to try this! Oh Erin, why do I not live next door to you? This looks so good. 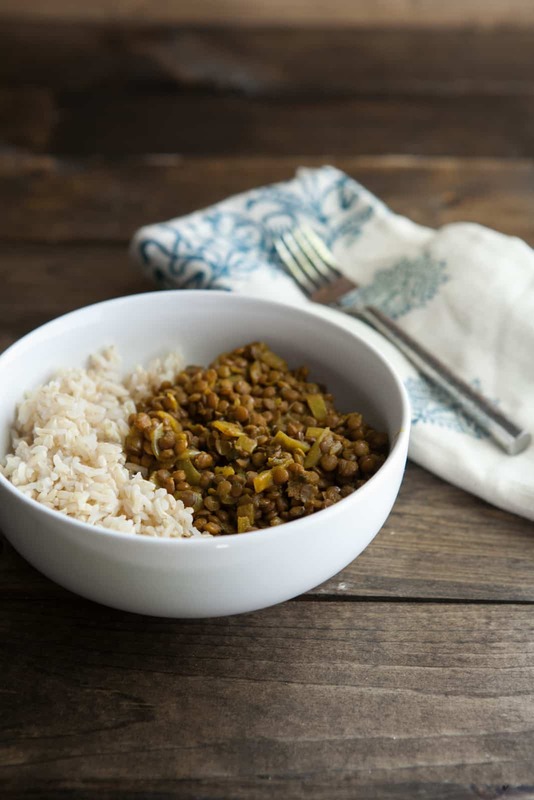 I just had some lentils last night that I cooked for weekly meals on Sunday and just couldn’t get over how much I loved them, but after reading this post, I wanna make another big batch of lentils and try this out with the chutney! The chutney without any sweetener and with dates in it. Love! I restock my jars of rice, beans, lentils and nuts every few weeks and you’re right, it really does save a lot of money. I give my dad such a hard time for buying pre-cooked lentils and TJ’s. Lentils, of all things, are so cookable. This looks like an awesome recipe! I often turn my lentils into curry but tend to sort of wing it with the spices. You should make a batch of the chutney to can or freeze for rhubarb-less times! it seems really tasty!! and beautiful photos too! I love the new bulk bin section! I consistently shop in the bulk bins…and I can’t believe how much money I save! In fact, these days, I kind of scowl when I have to buy oatmeal in a package…it’s ridiculously marked up. And speaking of rhubarb chutney…we are on the same wavelength. I’m posted a dish made with rhubarb and onion chutney on Monday! Love the addition of dates to yours – I will need to try that! I love rhubarb. I’m so glad to find it in something besides pie, though! I am all ABOUT the bulk bin. Good organic veggie section, properly raised eggs, and a huge bulk section that’s what I look for in a grocery store. And frankly, the bulk bins are the only reason I go to the grocery at all during Farmer’s Market season! I made this for my family last night. It was really delicious. I think my favorite part was the rhubarb chutney. This is the perfect recipe to use up some of my frozen rhubarb! And I think I even have everything on hand besides the dates! Great recipe – can’t wait to try it! Tried this today! So great–before I could even make the lentils, I spread some cream cheese on a cracker, and topped it with this chutney….WOW!! Fantastic. And, no cupfuls of white sugar–quite the plus, imho! Wow, this was amazing. Had it for dinner tonight and it’s going directly on my favorites list. Absolutely love the rhubarb chutney alone and paired with the lentil curry. This one is a winner! Chutney is another thing that I didn’t really grow up with…had it a few times, heard people talk about it but have NO IDEA what you do with it? On top of curries wouldn’t have come to mind (is this a common thing?). What does everyone do with it other than as a sandwhich spread (I think that’s what I’ve seen my parents do with it haha). Dinner has come and GONE! Rhubarb concoction: YUMMY! I really liked it! Un-familiar with rhubarb, I didnt tinker at all (other than halving the recipe). Surprised how sweet it was, a little on the too sweet side for me and a savoury/spicy dish but certainly added nicely when stirred through the curry! Looking forward to trying this ontop of some ice cream! I have made this more than a few times since you originally posted it. Tonight I scored some organic rhubarb from a neighbor and knew IMMEDIATELY what I’d be making for dinner. So so good. Made this tonight, and loved it. 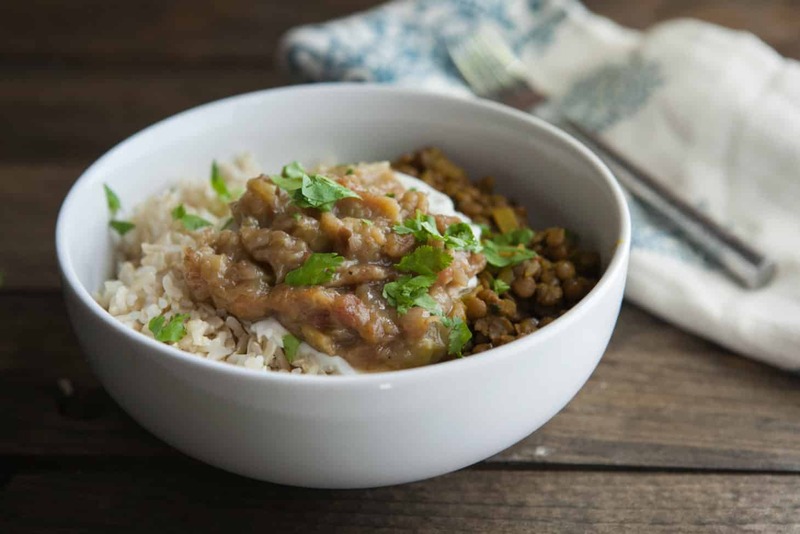 The curried lentils are so easy and so good…but the rhubarb chutney is amazing! Loved the bright fruity flavor. And now I’m so glad I froze some rhubarb before summer was over.